Automatically copy MySQL database to a specified remote or local MySQL database, ability to select any items of MySQL and automatically copy the newly-created MySQL database items. Automatic Backup Scheduler for MySQL > Tutorials > Copy MySQL database items to a remote MySQL database automatically. Copy MySQL database manually is really boring. If your database is very huge, select the items of MySQL database to copy is a very troublesome thing. Especially when the structure of the database changed, you have to reselect all of the items. Maybe you can try a software which can help you automatically copy MySQL database, and then enjoy your life. 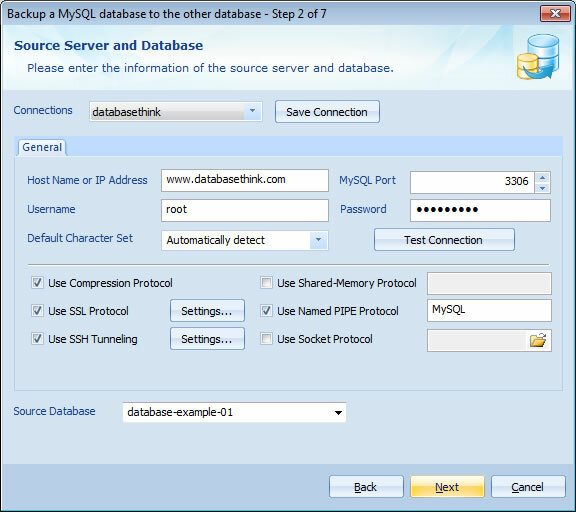 Step 3: Connect the remote MySQL server and select the MySQL database which you want to copy. Please enter the information of the remote MySQL server and select the database which you want to copy on Step 2 of the Task Wizard and click Next. 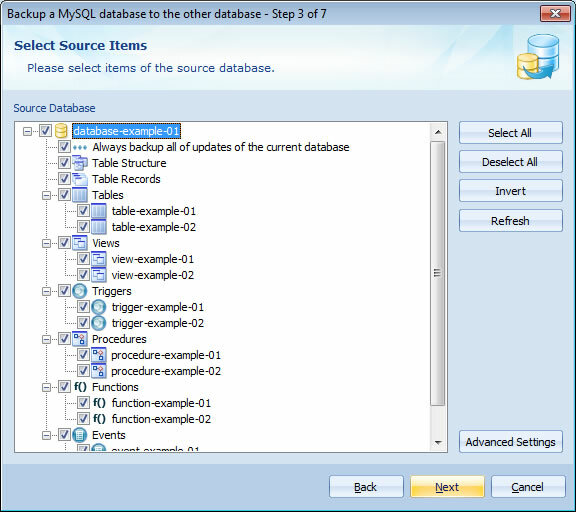 Souce Database: Select the database on the source MySQL server which you want to copy. Please fill out the General options before select the database, or please enter the database name. Read more about set up the options of Source MySQL Server and Database? Step 4: Select the items of the source database which you want to copy. Please select the items of the source database which you want to copy and set up the advanced options on Step 3 of the Task Wizard and click Next. Automatically copy the newly-created MySQL databases. Please check the option Always back up all of updates of the current database and the software will automatically add the newly created items and remove the dropped items from the source database list of the task for copying, you don't need to edit the task manually. Copy Table Structure or Table Records? Easily to choose. If you check the option Table Records, the software will copy the records of the selected tables, those are te INSERT statements. Advance Settings to optimize the copy ( Innodb, Master and Slave, etc. ). Easy to make the copy from InnoDB databases and tables. 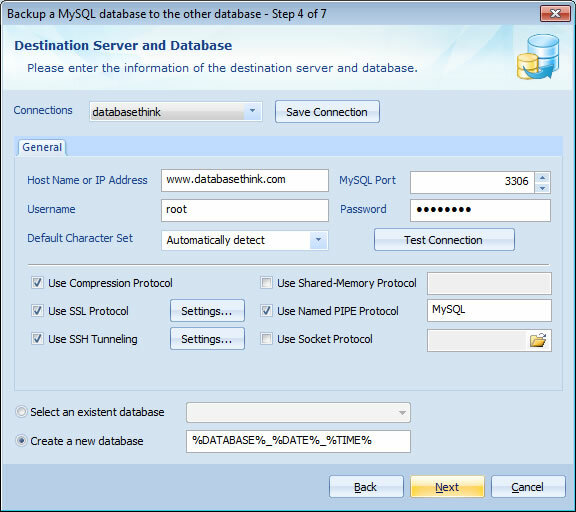 Step 5: Connect the MySQL server of destination database. Please enter the information of the desitanation MySQL server and database, and select or enter the database which you want to copy to. Select an existent database to store the source data. If your want to select an existent database on the destination MySQL server to store the source data, please check the option Select an existent database, click the arrow to select a database or enter an existent database name. ( Case Sensitive ). Automatically create a new database to store the soure data. %DATE%:The date when the destination database is created(in the "YYYY-MM-DD" format). %TIME%: The time when the destination database is created(in the "HH-MM-SS" format). Note: You can insert any valid character(letters, figures, underline, etc.) between two MACRO variables, but please don't change the MACRO variables which are surrounded by '%'. Please click Next and choose the Task Scheduler for running the task on Step 6 of Task Wizard to copy MySQL databases on schedule. That's all. The software will automatically copy the MySQL database items to the remote or local destination MySQL server.